When we first caught wind of Barnes & Noble's Nook -- a device clearly positioned to give the Amazon Kindle and Sony's options a run for their money -- we were understandably interested. As voracious readers and lovers of fresh gadgetry, pretty much anyone on the staff at Engadget would tell you that a new contender on the e-reader scene is more than welcome. When we discovered that Barnes & Noble's offering would not only feature a full color touchscreen component, but would run Google's Android OS as well... let's just say we were pretty much in gadget-hog-heaven. We weren't without our reservations, mind you; the appearance of this device made for some pretty heated conversations amongst the staff over whether or not we were seeing the dawn of a truly commercially viable e-reader. Of course, for us the proof is always in the pudding, and since B&N is about to launch a full assault against the current offerings, it's our duty to turn over a report. 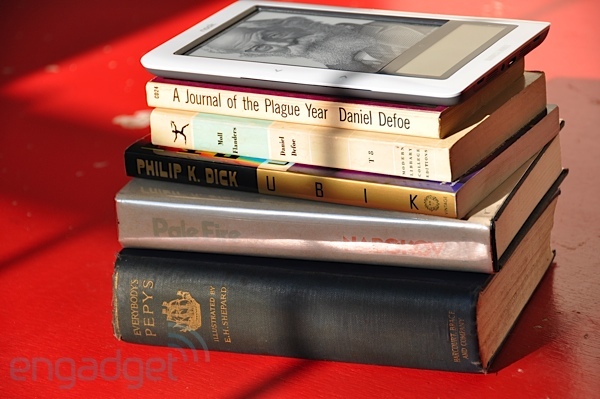 Is the Nook the answer to our e-reader prayers, or just a stepping stone to greener pastures? We've taken a long, hard look at the device -- so read on for the official Engadget review. If you're a Kindle user, the industrial design of the Nook will come as no surprise to you. Barnes & Noble is certainly not breaking an enormous amount of ground with the device, though the company has made some significant design decisions that set this unit apart from its competitors. The Nook is smaller in surface size -- though thicker and slightly heavier -- than the Kindle. Its size is akin to a typical trade paperback, measuring 7.7-inches by 4.9-inches, half an inch thick, and weighing in at 11.2 ounces. It's certainly not big or bulky by any measure, but it feels solid and substantial in your hands. The daintier folks out there may find it slightly heavy when being held for long periods, but hey, that's why you've got a lap. The front of the device is comprised of essentially three parts; a 6-inch, 16-shade grayscale E Ink screen, a 3.5-inch capacitive color touchscreen below it, and a plastic border with back / forward buttons on either side, intersected by a black strip. On that strip is a lone "home" button -- a touch-sensitive version of the Nook's signature lowercase n. On top of the reader is a long, thin on / off button (or sleep / wake, as with the iPhone), and on the bottom is a MicroUSB slot, dual speakers, and 3.5mm a headphone jack. Around back the device's battery, SIM, and microSD access is concealed by a soft, rubberized cover (interchangeable with a number of trendy color variations). In all, the look and feel of the Nook is exactly where it needs to be, striking the perfect middle ground between cozy reading partner and lust-worthy gadget. You want to show it off to your friends as much as you want to curl up with it on a rainy day. We think Barnes & Noble has overcome a lot of the technical harshness of the Kindle by removing many, but not all, of its physical buttons... though that comes with other tradeoffs (more on that later). Barnes & Noble isn't saying what kind of CPU beats inside of the Nook, though we're going to go ahead and guess it's not anything monstrous. Besides that, the device ships with 2GB of storage onboard, and has that microSD slot for expansion up to 16GB (we assume, it's SDHC). The Nook has WiFi (802.11b/g) and AT&T 3G radios, but RAM and ROM numbers are a mystery to us. We're sure that iFixit will change that shortly. The main display on the Nook is exactly what you'd expect... and we do mean exactly. There is little-to-no difference between the contrast and clarity on this screen versus its competitors, likely because it's the same screen made by the same company. The E Ink display does a perfect, though predictable job of generating easy to see and easy to read text and images on the screen. In our tests -- and this may just be due to the Kindle we were using -- we felt it very slightly outperformed Amazon's option in contrast, though the Kindle has a considerably faster refresh rate when turning pages. In fact, the Nook's refresh speed was sometimes a little annoying, with us actually having moments in between page turns of waiting for more content -- not a feeling you want to encounter if you're trying to mimic the book-reading experience. Still, as we said, there is nothing dramatically bad about the display, but there aren't many improvements either. Photos and various font sizes looked clean and clear, and we had no trouble finding the right configuration for flipping through both periodicals and longer-form material. 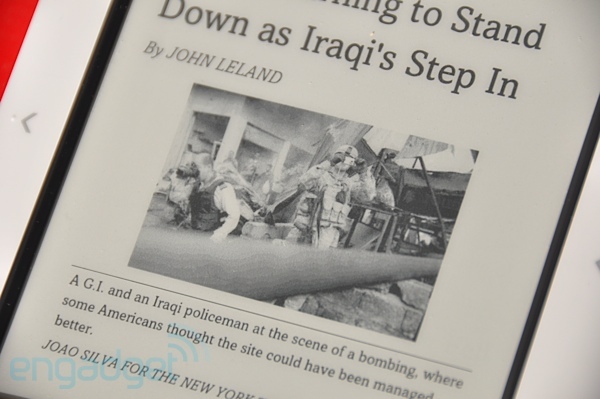 What really sets the Nook apart, however, is that thin color display that sits just below the main reader area. That display -- a color, capacitive, touchscreen -- is the way in which almost all interactions with the Nook and its online store are handled. Besides being the primary method of interacting with lists and reading selections, at various times it becomes your notation navigator, your search box (with keyboard), music player, and a Cover Flow-style book browser, amongst other functions. The general concept behind the screen is ingenious and very much in the vein of the iPhone -- a one-size-fits-all portal that can be whatever you need it to be. This works perfectly with some functions of the reader, and comes up short in others. In particular, one of the ways in which this navigation is hampered is by the color screen's need to interact directly with the E Ink display. Waiting for the refresh when you're moving around on the faster color screen can be annoying, though like many aspects of navigation on the Nook, it's all about learning the pace of the reader. See, it's not exactly that fast of a device anywhere, color screen or otherwise, so you have to get used to all kinds of little pauses and punctuation in the experience. That said, we still found it a little trying to wait for that upper display to refresh, but right now that's the nature of E Ink displays -- the technology is really in its infancy, and learning to live at a slower pace is the name of the game if you're serious about using an e-reader. Software aside (we're getting to that), the color display was reasonably responsive, though we did have some nagging issues with scrolling through lists; we often had trouble getting the screen to recognize downward swipes. It seems possible that the cause was the extremely narrow height of the screen, but it's also possible contact just wasn't being registered correctly. Still, the display looked good even at low contrast (we kept it down -- high contrast against the backlight-free E Ink looked a little intense), and being able to actually see what book covers looked like when we were shopping, tap out searches on the generous keyboard, or just shuffle our music while reading was very welcome. Ultimately, where the Nook is made or broken is its software. As we've already established, the general hardware experience is not wildly dissimilar from its main competitor. The real proving ground with a platform and store as new as the ones offered here is in the day-to-day use of the device. 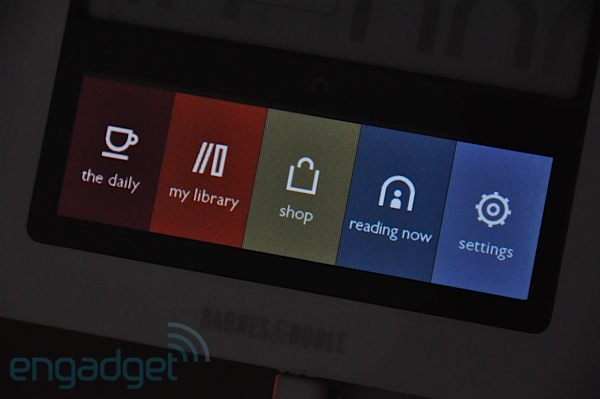 At first blush, the Nook's user interface and navigation is a bit overwhelming. If you're coming off of any traditional reader, even one as complex as the Kindle, what Barnes & Noble offers seems far more daunting. Aside from having to learn a completely new way of getting around, adding that dual screen interaction to the mix is rather confusing when you first flip the switch. The foundations of the UI aren't hard to understand, but if you walk into the device without knowing your way around, you'll end up feeling pretty lost at first. Once you get the hang of the system it starts to make some sense, but it's nothing we'd describe as intuitive, and your rhythm is thrown off by one major factor: the extremely sluggish response of the device. section of the device you're in (it's different for every area), and pressing the n again takes you back to your homescreen. At the homescreen, you have five basic options for navigation: "the daily" (where periodicals, notifications, and notes from the mothership arrive), "my library" (you guessed it, your books), "shop," "reading now," and finally "settings." This is clear enough, but it's the sub-menus that cause some confusion. Within each of those sections you're presented with scrollable list of options like "search," "view my documents," or "show covers" (those are all from the "my library" section by the way, but it's different everywhere). You're able to tab into those sections where you'll find yet another set of navigation, also different depending on what you've chosen. While you're jumping around through those menus, your screen up top is updating and changing in accord with your picks. You're able to scroll and make selections in the upper screen in most menus using an up and down arrow on that lower screen along with an "enter" (or engage) button represented by a small circle. Wait, we forgot to mention that you can also use the tactile back and forward buttons to flip some pages on the upper screen in select pages too. Got it yet? You should be confused -- we know we were. The thing is, once you get the hang of the system it starts to make some sense, but it's nothing we'd describe as intuitive, and your rhythm is thrown off by one major factor: the extremely sluggish response of the device. That's right, you're not zipping and zooming through any of these menus, you're patiently waiting for the device to do its thing. That laggy scrolling we saw in the demo the day this was launched? Not really much better in the release version. Now that's not necessarily a deal breaker here -- after all, the Kindle and Sony readers aren't exactly speed demons, and you're not buying this thing to work on spreadsheets or play Doom. Still, the navigation combos are confusing at first (even after hours of use, we still found ourselves gazing blankly at the Nook, trying to remember what exactly we were supposed to press to get where we wanted to be), and the performance feels stuck in the mud. While the UI is different (not necessarily a bad thing in our eyes), there are also places where it is plain bad (necessarily a bad thing in our eyes). There's instability to spare in the review unit we used. More than once we saw the familiar Android force close / wait message when trying to load a piece of the software up, and we encountered a lot of unexpected pauses and lag when trying to get through menus, causing a number of incorrect selections and general annoyance. There are also UI decisions that don't make a lot of sense to us, like requiring you to open a secondary menu to pop up the music player, or the fact that when you want to read one of your items, you have to essentially select it twice to open it. It wasn't a total mess, but there were certainly more errors than we've ever seen on our Kindle, and that's not great for Barnes & Noble coming out of the box. There were other problems too, like the fact that the reader doesn't always organize books correctly by taking "the" or "a" out of a title -- it's hit or miss -- making for a bit of a mess when you're dealing with a large list. Still, there are things the company is doing with the Nook that are worthy of praise. Once you learn the pacing and menus of the reader, the experience gets a lot more enjoyable. We also think B&N's store options and book browsing are far better than what Amazon offers. When it comes to looking for a title, being able to actually see the covers of books is a tremendous help (especially if you know what you're looking for). Additionally, having both the lower and upper screen for content and navigation is a big boon. The Nook also functions as a decent PDF viewer and surprisingly solid music player, though we were bothered by the fact that every time it switches a song, the lower screen lights back up -- that's not good for battery life or for reading. The question one has to weigh is whether or not the software is more of an aid or impediment to what the device was designed to do (book reading, remember? ), and in our judgment, it's the latter. It's just downright unpleasant to use sometimes. Many of the problems seem like they could be fixed with firmware tweaks, and Barnes & Noble reps we spoke with seemed to indicate that they would be coming OTA in the near future. 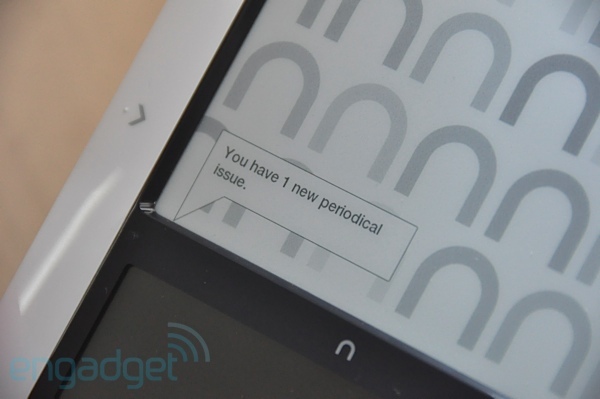 Let's hope that's the case, because using the Nook right now is a very uneven experience. 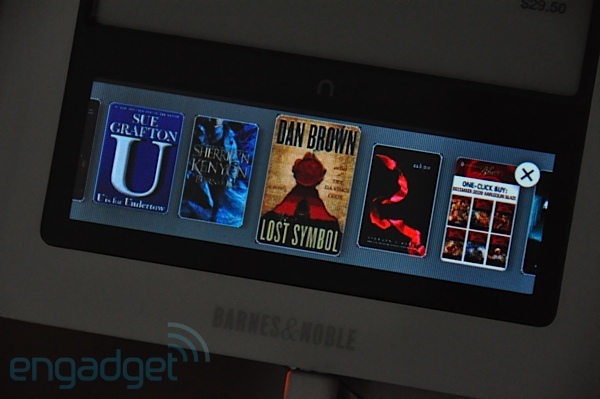 Besides the hardware itself, Barnes & Noble is launching a handful of new services with the Nook. Most obvious is that the device will offer free AT&T-based 3G service for shopping and downloading content, along with built-in WiFi. That WiFi is notable as well, since the company will be enabling free access for the reader at its retail locations come Q1 2010, and along with that access will come some pretty handy features, like the ability to browse an entire book while on the store's network (for a total of an hour's browsing per book per 24 hour period), and B&N says it will offer special content to those using the reader in-store. Additionally, the Nook sports a book lending feature called LendMe, which allows you to hand a piece of content over to friend with the reader or Barnes & Noble's e-reader software for up to 14 days. Just like someone borrowing a real book, it's removed from your library for the duration of the loan. Of course, not every publisher is on board with the service, and only about half of the retail selections will allow for lending come launch. Besides just allowing you to trade between friends with the Nook, you'll also be able to swap your stuff down to someone with an app on their iPhone or iPod touch, PC, Mac, BlackBerry, and eventually Android devices. B&N is also touting the inclusion of Google Books titles as one of the major features of the Nook, allowing you to freely download half a million selections from the big Gs library of public domain reprints. It's a nice feature, but it can also make finding something you're looking for in the store a bit of a hassle, as you end up with myriad versions of a particular book. Still, the added ease of access to the collection is definitely nice, and we're not about to knock it. Ultimately, the best addition here isn't Google Books or the free WiFi; it's the Barnes & Noble book buying experience. If there's one thing the company knows how to do, it's sell books, and that's clear when using the Nook to browse or purchase titles. The on-device experience shines, and knocks the nearest competition around handily. All this other stuff? Just icing on the cake. Going into this review, we'd spent a lot of time thinking about what this device meant for ebook readers. 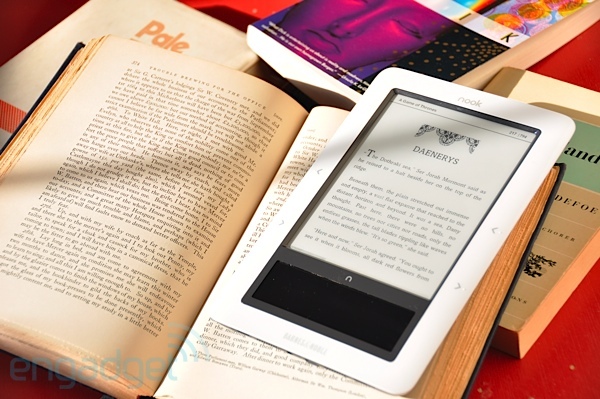 We had debates; pointed arguments about whether the Nook is the kind of front-and-center, mass market device that could bring the electronic book concept to a much larger audience. That might be the case, but after spending some time with it, our concern is what that experience will ultimately be like for those users. Throughout our testing with the Nook we vacillated between being completely charmed by the aesthetics of the reader, and completely frustrated by the way it actually works. In many ways the Nook has a leg up on the competition -- not just by its presence in Barnes & Noble stores (though that helps), but by providing an attractive package and feature set, offering personalization (via add ons and accessories), a huge selection of books, perks like the LendMe feature, that color screen, and the excellent buying experience. On the other hand, when it came to day to day use, we felt let down in a big way, and can only imagine how magnified that feeling would be if we'd gone and shelled out nearly $300 for the device. In the end, the Nook is an intriguing product launched by a powerful force in the world of booksellers, but the initial offering feels long on promises and short on delivery. With the right software revisions, the Nook could be a tsunami, but as it stands right now, it's only a mild swell.